The Loch Torridon Community Centre now has a Facebook page which can be seen at Loch Torridon Centre. It's a great way to keep up to date with events and happenings at the Centre. For more general information about the Centre, visit the website. Did you think this popular "classics" musical evening in the Loch Torridon Centre might be "too highbrow and stuffy" or even "too lowbrow and frothy", and therefore missed out? Then miss out you surely did!! Husband and wife team Robin and Kim Colvill (piano - solo, duet, accompaniment and narration) with John Morgan (baritone)(The Maestro Trio) flew in specially on Thursday (August 15) and delivered a cultural treat for everyone in their light-hearted "musical journey", with infectious joie de vivre, engagement with the audience, and undoubted international musical class. Feet were visibly (not audibly) tapping to the exuberance of (e.g.) a Strauss Polka, Gilbert & Sullivan's "Pirate King" and Sigmund Romberg's "Drinking Song" (The Student Prince); relaxed enjoyment, quiet delight, or touches of drama took over with (e.g.) Schumann's "Widmung" love song, Mozart's Andante in F (Sonata in F for 4 hands), and Javert's song (Les Miserables); and the odd nostalgic tear may have appeared with (e.g.) "Somewhere" (West Side Story) and "Some enchanted evening" (South Pacific). Kim's engaging narrative held it all together and taught us much: (did you know that the first performance of West Side Story on Broadway ended in a riot?!). This "gig" features successfully all over the world. All we had to do was roll up to the Loch Torridon Centre at a knock-down price! Well done to the TAC team for setting it up. Peter Evans, correspondent for the Inverness Courier spent a fabulous day on Beinn Damh where he met "yours truly" - unbeknown to me! Read the article here (for as long as the link works). Daniel Gordon of the University of Leeds and a regular visitor to Torridon, has composed a choral piece (provisionally titled "Torridon - Fragile Shell") which will have its first performance in Halifax Minster on 26th May. The piece will be performed by Leeds University Liturgical Choir, with oboe and organ. The piece contains quotes from local historian Murdoch MacDonald's "Walking into the Past" book of historical walks. Daniel hopes to be able to make a recording. 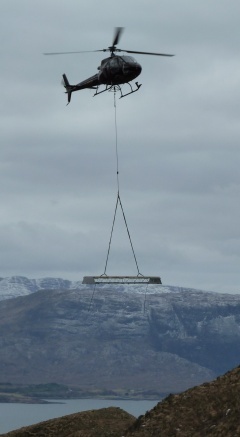 On the 4th April 2012 a new footbridge was airlifted into place on the hill path leading to the Horns of Beinn Alligin. 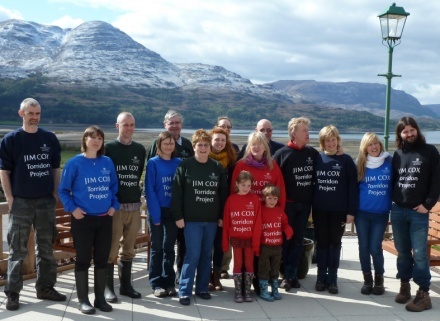 The new bridge was donated by the Jim Cox Torridon Project. This project was set up to raise money for a lasting tribute to Jim Cox who sadly passed away last year. Jim and his wife Eileen have been enthusiastic visitors to the area for many years and own a house in the village of Wester Alligin. Jim's friends and relatives raised a staggering �20,000 to be spent in the area, and in cooperation with the National Trust for Scotland it was decided to spend the money on this footbridge which urgently needed replacing, an automatic visitor counter to assess the footfall, and to assist in the financing of footpath improvements on the higher parts of the hill. 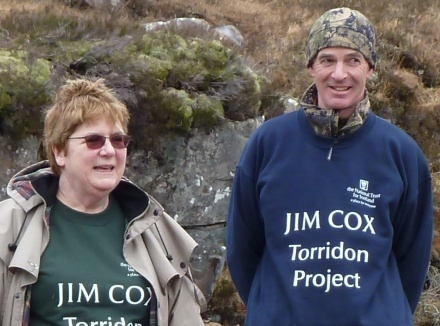 Eileen is pictured above with Seamus Macnally the NTS ranger for Torridon. 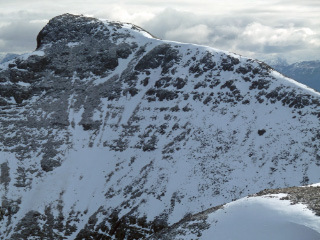 Helicopter services were provided by PDG of Inverness, who treated us to some spectacular flying! Unseasonal snow had fallen on the previous day and indeed was still falling as we made our way up to the bridge site. Sixteen members of the Project, myself, and a BBC camera woman were on hand to witness the arrival of the bridge, and Seamus, with his team of helpers, was ready to complete the construction ready for the arrival of the first walkers. Meanwhile the Project team retired to the Loch Torridon Community Centre for soup, sandwiches and a dram. The sun came out and the team posed for a group picture. On Monday 31st January, eight golfers from the villages of Diabaig, Alligin and Wester Alligin competed for the Torridon Cup. 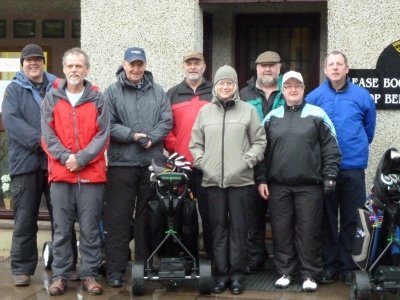 The venue was Gairloch Golf Club and despite a decidedly unpromising weather forecast, battle commenced at 11am after a hot drink in the clubhouse. Four teams of two were selected in a pseudo-random fashion and the rules for a Greensomes tournament were explained. Of the eight players half had official CONGU handicaps - the other four had to be allocated handicaps in a "diplomatic" fashion. After nine holes we retired to the clubhouse for refreshments - a mountain of sandwiches, Torridon smoked mackerel, a choice of cake, and an extremely potent hot whisky punch. On the basis of first half performance a couple of adjustments were made to handicaps and the second nine started with only 5 shots separating the whole field. The weather held off wonderfully and spirits were high. The competition remained nip and tuck to the final hole - a testament to the Greensomes format which worked extremely well for a field containing handicaps from 13 to 36. After the swapping of golfers' tales, and the tallying of scores the trophy was presented - to the wrong team! Eventually, after much recalculation and deciding a tie on the back-9 score, the Cup was awarded to Donald MacGregor (Alligin) and Avril Turner (Alligin) - well done! 2011 has not started well in the Community with the loss of three residents. Peggy MacDonald of Torridon, Murdo MacDonald of Wester Alligin and Ian Mitchell from Diabaig all passed away within a week or so of Hogmanay We would like to extend our sincere condolences to the families of them all. Since November the Community has suffered from the severe weather conditions like everyone in the area. The early snow in November meant that the Murder Mystery dinner was cancelled. An attempt to reschedule the following week was also a disaster. The members of the cast and the 60 ticket holders were very disappointed but hopefully Torridon Arts and Culture will be able to restage the event in early summer when weather should not be a problem. Torridon School were unable to hold their end of term film show and the Community Christmas party was also cancelled because of the snow. The Torridon Hall extension project is now approx six weeks behind schedule because of the low temperatures but January has seen the frame go up and it is hoped that it will be wind and water tight by the end of January. Many thanks to Kingsteps the contractors who coped with the elements and have done their best to minimise disruption to the community. The craft workshops commence on Feb 14th and will run every second Monday in the month from 10am - 4pm. Everyone is welcome and the cost is �5 for the day including lunch. On March 14th there will be an opportunity to do Easter sugar craft with June Oorloff. The workshop is always grateful for craft materials and if anyone has any remnants of new fabric or buttons they don't want they would be appreciated. Please tel 01445 791270. Awards for All have generously offered Torridon Arts and Culture a grant to buy a stage extension - this will enable hall users to set up raised performance areas and catwalks as well as simply enlarge the existing stage. Whist drives have begun on alternate Wednesdays in the hall from Wed 2nd Feb through to 30th March at 7.30. This is a fun evening and everyone is welcome. Dates to note in the future are the Edinburgh Quartet concert on Tues 26th April and the Alligin 'Feis' on Saturday 28th May. The popular Food and Craft Fairs will be running through the summer holidays every Friday from July 8th - Aug 26th.